Tata Naka dress, £729 through www.tatanaka.com. Bag, $89 through www.lifeofmanek.com. Prada shoes, $885 at Nordstrom (www.nordstrom.com). This Ilk earrings, $62 through www.thisilk.com. "Capri is one of our favourite places," says Tata Naka designer Tamara Surguladze. For spring, she and her twin sister, Natasha, focused on the sun-soaked Italian locale for inspiration. The result is a range of looks boasting octopus, fish and Ancient Roman motifs presented like the glazed patterns found on the island's pottery. "Capri has a style of its own," says Surguladze, who notes the duo has travelled to the region many times over the last 15 years. "Capri style is about expressing the best of yourself; the happiest, the most carefree version of you comes out." Apiece Apart dress, $425 (U.S.) through www.apieceapart.com. Ela bag, $178 through www.elabyela.com. Stella McCartney shoes, $1,435 at Nordstrom. This Ilk earrings, $62 through www.thisilk.com. Known for drapey, easy-to-wear pieces in soft cottons, linens and silks, New York-based Apiece Apart sources print influences from around the world. 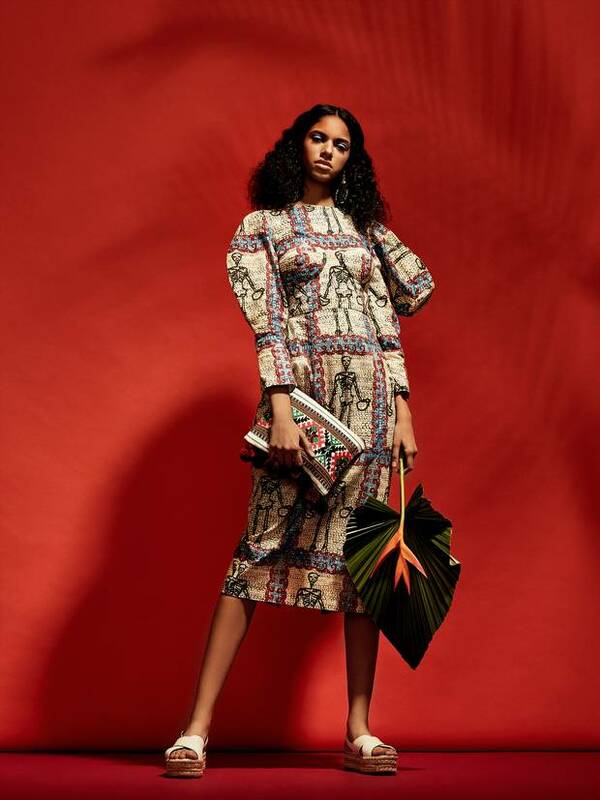 This season, its chic array of desert-worthy dresses and tunics is rooted in Africa. Several garments riff on the geometric patterns of the Masai people's traditional attire, while this silk kaftan's bold print is reminiscent of the graphic style of the Berbers in North Africa. Paule Ka dress, $640 (U.S.) through www.pauleka.com. This Ilk earrings, $46, bracelet, $62 through www.thisilk.com. Monsieur Panier bag, price on request through www.monsieurpanier.ca. Prada shoes, $885 at Nordstrom. Paris-based designers have long looked to Japan for inspiration, so it's no surprise that Paule Ka's creative director, Alithia Spuri-Zampetti, drew from the country's rich design history for the brand's latest offering. Her first trip to the country – which included stops in Tokyo, Kyoto, Hirsoshima and Miyajima – prompted Spuri-Zampetti to create a variety of pieces with nods to origami and sports uniforms. Dressing in Japan, she says, "was much more expressive and personal, and that was something quite different than what I'm used to." Makeup and hair by Robert Weir for Charlotte Tilbury makeup. Prop styling by Jaime McCuaig. Model: Crys at Elite Model Management.